Greek Default Watch: Is Greece Fudging its Deficit Numbers? Greek statistics have come a long way, and I do not mean to suggest that Greece’s numbers are wrong. Rather I want to focus on a specific question: to what extend are the budget deficit numbers reported by the Ministry of Finance a reliable indicator of how much Greek finances are improving? 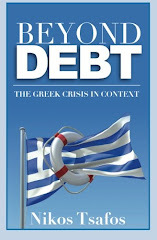 In June 2011, Greece’s central government deficit stood at €12.8 bn or 23% higher than the target deficit of €10.4 bn. According to the Greek government, the measures implemented in the medium term strategy should close that gap by year end. 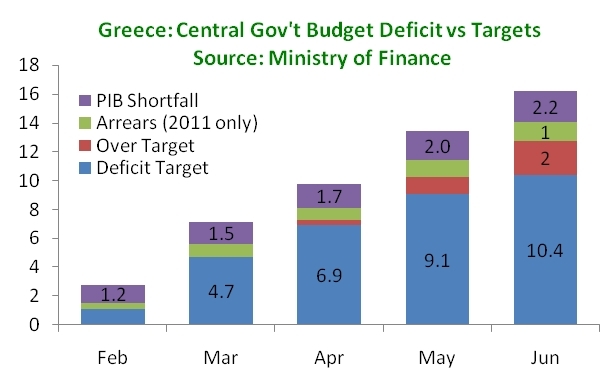 Yet these numbers severely under-estimate how off the target the budget truly is: while the deficit is 23% higher, Greece (a) has made severe cuts to public investment and (b) has continued to accumulate significant arrears (overdue bills). With these two pieces the deficit may be more than 50% off target. First, look at the Budget Execution Monitor published by the Ministry of Finance, which shows that starting in May 2011, budget deficits have become progressively off target: in fact, by June 2011, there is a €2.3 billion gap between the target deficit and the actual deficit. So far so good. Second, zoom in on the drivers of that gap: compared to the target, revenues are lower by €3.3 bn (13%), while spending is €1.3 bn higher (4%). However, note that the Public Investment Budget is off by €2.2 bn – meaning that the government should have invested €2.2 bn more than it did. 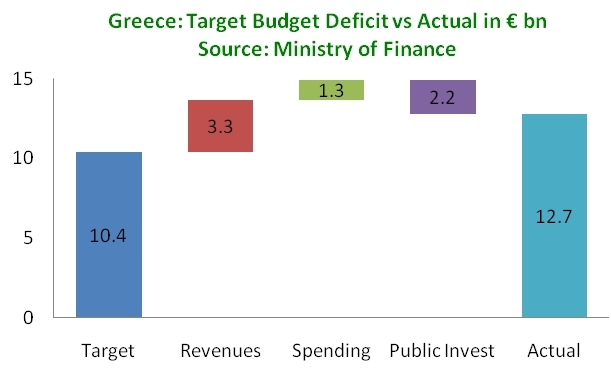 The lack of spending counts as a positive for the deficit, but effectively the deficit would have been €14.9 bn had the Greek government not simply choked off funding from public investment to keep its finances in check. Finally, look at government arrears, which are accumulated bills that the government has not paid. The Ministry of Finance reported those at €5.3 billion in December 2010; by June 2011, they had risen to €6.6 bn, a €1.3 billion rise. Technically many of these expenses are part of the general government budget, rather than the central government budget reported above. Adding them together is only half-right because it ignores all the other parts that turn a central government to a general government budget. Even so, Greece's targets with the IMF and the Europeans are general government targets – so by accumulating these arrears, the government is merely pushing further out expenses for the general government. 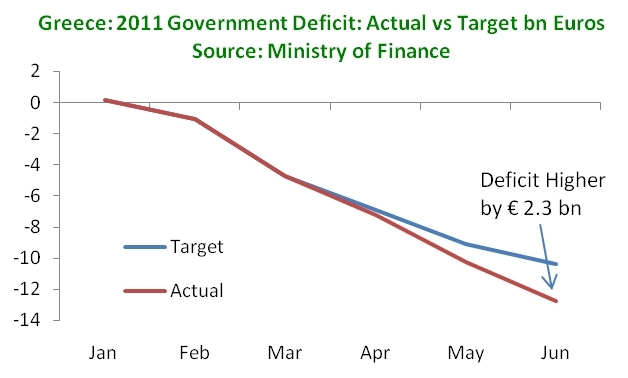 If we now add everything together, Greece was targeting a €10.4 bn budget deficit by June 2011. It ended up with €12.8 bn instead. But to accomplish this, it added €1.3 bn to its unpaid bills and it reduced funding for public investment by €2.2 bn. If the Greek government was paying its bills on time (ignoring the accumulated arrears by end 2010) and if public investment were on track, Greece’s budget deficit would be €16.2 bn and hence off by 56% rather than 23%. And that is a completely different picture about how well Greece is doing. Thank you for your brilliant analyses - here and in your other entries on the Greek crisis. Would there be any chance to find out, by and large, where the excess spending is going? Of course the official reason would be the recession. But since unemployment benefits seem to be low and (if I am not mistaken) only paid for a short time in Greece, this could not really account for the enormous spending gap. Also, some of these developments must have been calculated into the projection, so even if GDP is lower than expected, this can't be the whole story. I have taken a look myself at the figures from the Greek ministry of finance, but I'm not an economist or otherwise expert on budget questions, so I didn't get very far. 1) For one thing, Greece seems to have engaged some 25.000 or so new state employees lately. That might account for part of the extra expenses. So that even though the arrears are still higher this year, could that account for the rise in spending? 3) Another hypothesis of mine would be that the Greek companies have not been paying their dues to the social security and the state had to make up for it. Anyway, it might be an interesting challenge for a trained economist like you to make some educated guesses of how the gap between projections and actual status (in particular on the spending side) came about.